with all of your monthly expenses in one secure place. We’re excited to announce our improved online Bill Pay effective Mar. 12, 2018 for all of our members. An improved Bill Pay interface design and layout means making payments is more simple and more intuitive than ever before. Enjoy a seamless Bill Pay experience built within the Online Banking interface without being sent to a standalone separate Bill Pay page. Enjoy the expanded functionality of the improved Bill Pay on your mobile device. Add, edit, or delete payees and payments from either Online Banking or the Mobile App. Make updates to existing payments or schedule new payments from any device, any time. The simplest way to pay back friends, family, co-workers…anyone. Send money securely from your Members 1st account to just about anyone with an email or mobile number. Money moves directly from your Members 1st account to the recipient’s bank account. Jane sends a payment by text or email to Amy. Amy opens her text or email and enters her routing number and bank account number. The payment is passed electronically from Jane’s account to Amy’s account. Although all your payee address and account information will be moved over to the improved Bill Pay, if you have eBills associated with those accounts, they will not be moved over and will need to be set up again within the improved Bill Pay. In addition to your normal account history in each of your suffixes, Bill Pay retains it’s own payment history within the Bill Pay system. Six months of your existing Bill Pay payment history will be imported into the improved Bill Pay. If you need history beyond six months, please export your preferred history before March 5, 2018. The improved Bill Pay system will become available on March 12, 2018. An update to your Apple or Android device will be required in order to take advantage of the improved Bill Pay system. Your Payment HubView and pay all your bills from one place, from any device, at any time. Fast and SecureMake payments as quickly as one business day online, safely and securely. Payment NotificationsReceive notifications for upcoming due dates, completed payments, and much more. Flexible Payment OptionsChoose from check, ACH, or Person-to-Person for one-time and recurring payments. 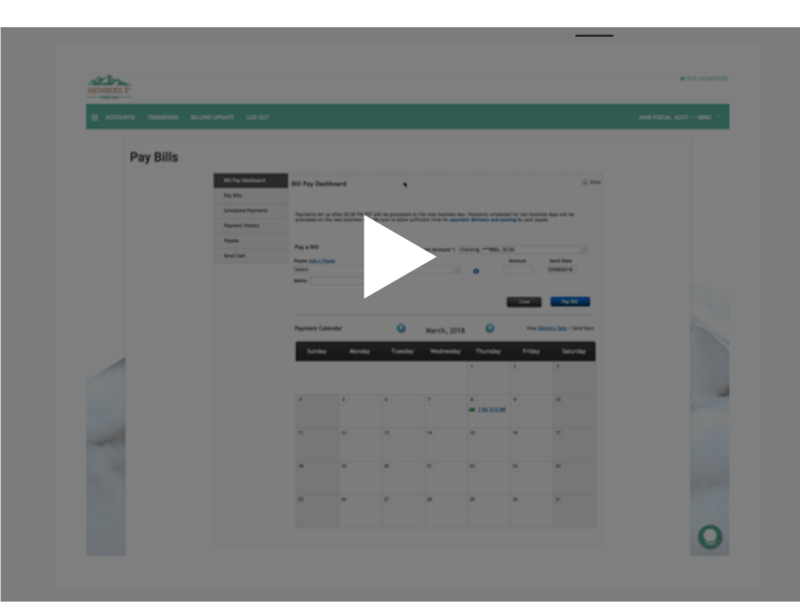 Bill StatementsView biller statements inside of Bill Pay and schedule to automatically pay bills. FreeCreate and schedule unlimited payments with no monthly or annual fee. When would be a good time to use Person-to-Person Pay? Person-to-Person Pay is designed to simplify your life. Use when needing to pay the babysitter, pay for your portion of dinner with friends, recurring rent payments to your roommate, and much more. Will eBills move over to the improved Bill Pay? eBills will not be moved over to the improved Bill Pay and will need to be setup again with a payee. However, all payee information including name, account number, address, and phone numbers will be moved over to the improved Bill Pay. How fast are payments made? Overnight payments can be made for a small fee. Otherwise, Check payments are processed within 3-7 business days, ACH payments are processed within 2-3 business days, and Person-to-Person payments depend on when the recipient claims their payment. Do recipient’s of Person-to-Person payments need to have a Members 1st account? No, recipient’s will enter their routing number and bank account number to claim their payment. Will all of my Bill Pay information still be there? All of your payees, addresses, scheduled payments, and 6 months of payment history will transfer over to the improved Bill Pay. The only information not transferring over to the improved Bill Pay are eBills and payment history beyond 6 months. eBills can be setup again within the improved Bill Pay system. Payment history beyond 6 months can be exported from the old Bill Pay system before Monday, March 5, 2018. Will payment history move over to the improved Bill Pay? Six months of payment history will move over to the improved Bill Pay. Payment history beyond 6 months can be exported from the old Bill Pay system before Monday, March 5, 2018. How much do bill payments cost? All bill payments are free; however, next-day rush delivery payments incur a small fee. See the credit union’s fee schedule for more information. Can I use Bill Pay to perform an international bill payment? No, Bill Pay is for paying bills securely within the United States. Can I use Bill Pay to perform an international person-to-person payment? No, Bill pay is for making secure person-to-person payments within the United States. What is the minimum/maximum transaction amount I can make on a bill payment? The minimum amount is $1.00 and the maximum amount is $20,000 for a Bill Pay payment. What is the minimum/maximum transaction amount I can make on a person-to-person payment? The minimum amount is $1.00 and the maximum amount is $20,000 for a person-to-person payment.